Our Scottish Salmon is farm-raised in the Scottish lochs where the water is cold and the current is strong. It has a higher fat content than other types of Atlantic salmon. Available for purchase at your local Earth Fare, Harris Teeter, Publix and Food City. Available at Harris Teeter, Publix, Food City, and Earth Fare. 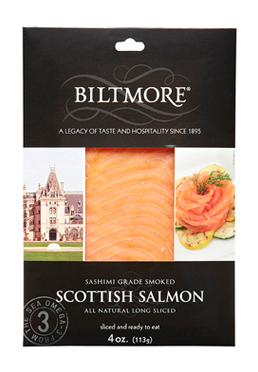 Elevate your next omelet with Biltmore Smoked Salmon!